GROWING UP, I DIDN’T have all that much formal exposure to the arts. Not at home. Not in school. Not outside of either. Life was different back then, in the 1960s and early 1970s, with families in my southwestern Minnesota farming community simply working long, hard hours to survive. We didn’t, for the most part, have art galleries and live theatre, concerts or art shows or any of those cultural centers and events that today are an assumed aspect of life, even in the most rural of areas. Despite that absence of organized art opportunities, I was not deprived of art. Rather, its presence was subtle—found in the flower gardens of Great Aunt Dora, in the dance of corn tassels on a breezy summer afternoon, in the patchwork symphony of quilts my Grandma Ida stitched, in the blazing orange of a prairie sunset painted across the wide sky, in the distinguishable cadence of a John Deere tractor, in the stones my great uncle rockhounds collected, sculpted and polished to shiny perfection. Those exposures to art were so much a natural part of my life that I never realized their significance as artful influences. Today I can find organized art anywhere, including right here in my community of Faribault. I embrace (most of) it with exuberance. And to the north, in neighboring Northfield, the arts scene is even more vibrant. The recently-installed “Tree of Knowledge and Delight” at the Northfield Public Library. 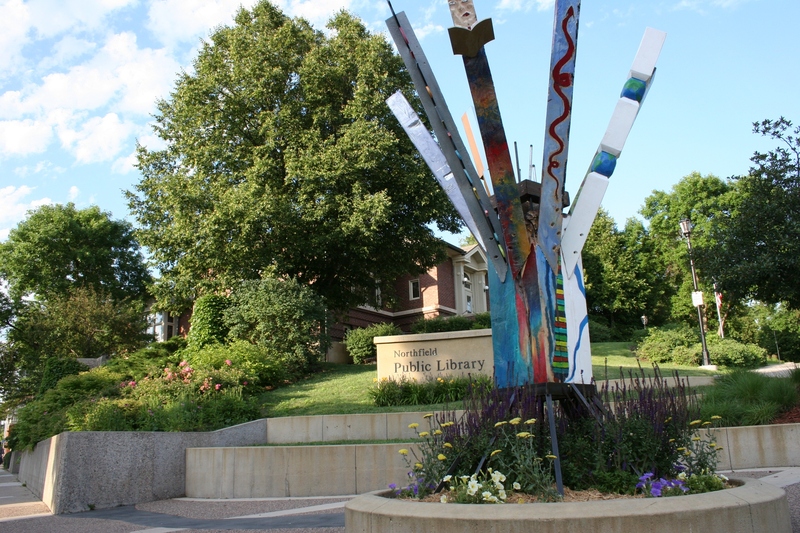 At 4:30 p.m. this Friday, June 29, Northfield celebrates its latest addition to downtown art at the official unveiling of the “Tree of Knowledge and Delight,” a sculpture created by 10 Northfield High School students and installed in the Northfield Public Library plaza. A St. Olaf College emeritus professor of art and a St. Olaf art apprentice guided the students in their non-credit, extra-curricular public art course which resulted in the sculpture. Funding for the Northfield Young Sculptors Project came via a $4,150 Legacy grant approved by the Southeastern Minnesota Arts Council. I viewed the sculpture for the first time Sunday evening. I’ll admit that I didn’t study the sculpture like I should have. But oftentimes it takes me awhile to warm up to abstract art. Eight branches comprise the tree sculpture. But if you take the time to examine the tree, you will see the visual themes related to learning and individual artistic expressions—the book, the faces, the snake, the harmony of colors and more. That students would have this opportunity to create such a sizable piece of public art seems exceptional. What an encouragement to them as young artists. 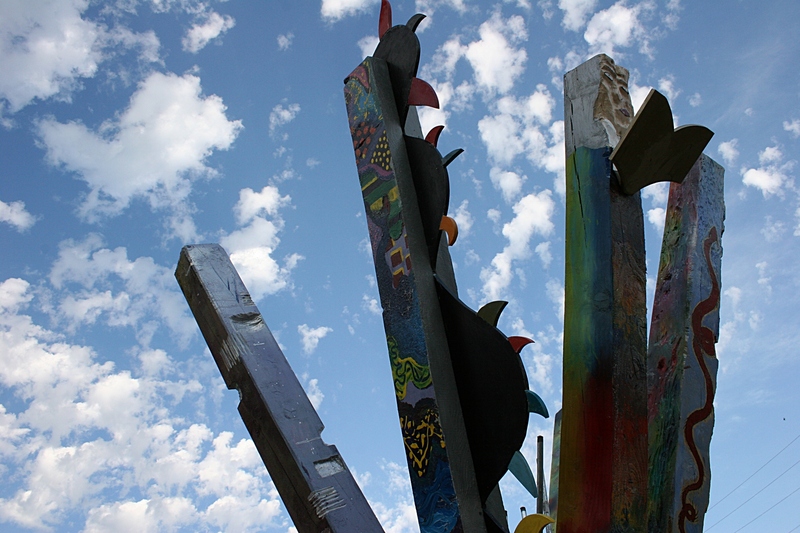 The “Tree of Knowledge and Delight” will remain at the library plaza for a year before relocating to a permanent home at Northfield High School. Plans call for a public sculpture to become an annual project for NHS students and their professional mentors. And that is good. Yet, aside from this organized project, I hope students will not overlook the art in their everyday lives. For that is the art which, as I see it, defines the artistic world in its simplest, purest, most grassroots form. FYI: This project was also supported by the Northfield Arts and Culture Commission, the Northfield Public Library, Northfield High School and the City of Northfield. 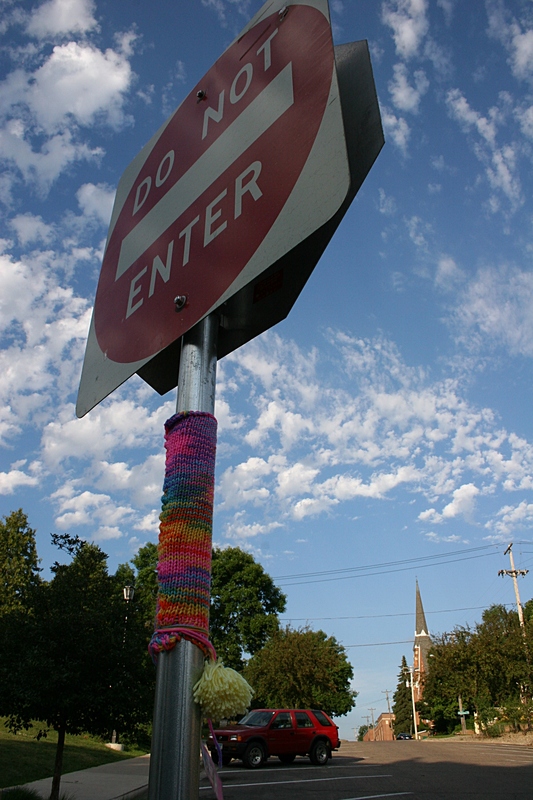 Right next to the Northfield Young Sculptors Project you’ll see this knit art wrapped around a “Do not enter” sign post. An attached tag, which includes a photo of a young woman, reads: “It’s immortality, my darlings.– Alison.” This is apparently a memorable line by character Alison DiLaurentis from the teen drama television series, “Pretty Little Liars.” Never heard of it. Any idea who placed this quote and knit art on the Northfield street sign? And what does that message mean anyway? My feeble brain is trying to recollect where I read about the random knit project. In some areas, it is more prevalent. The idea is to do such embellishments (of public areas) overnight and anonymously so they magically ‘appear’ in the morning. Kinda neat! When we moved to our area in ’74, one of the first things we learned is that this was a mecca for gifted artists of all types. There were art workshops, displays, studios, etc, everywhere and, in the summer, there were so many learning options one could get lost in such activities. Today, the artists and artisans are still here but the activities/workshops have, somewhat, gone away (for a variety of reasons). Evidence of the presence of such talented people are to be seen everywhere, however. Love living in this beautiful area!!! I first saw this type of random art in Fergus Falls. Thanks for the link explaining the project. No problem…..search engines are great when I figure out what words to use!! LOL! Exactly. And I never would have thought to use those words. The words I used were: “knit projects in public places”. Who would have thought that the ‘puter would have pulled out the exact info on the 1st try!!!!!! Your 1st Photo is bringing back great memories of spending time in that library – Great Photos! Always happy to bring back memories for my readers. So…are you a Northfield native, attended St. Olaf or Carleton, or simply someone who once lived in the community?